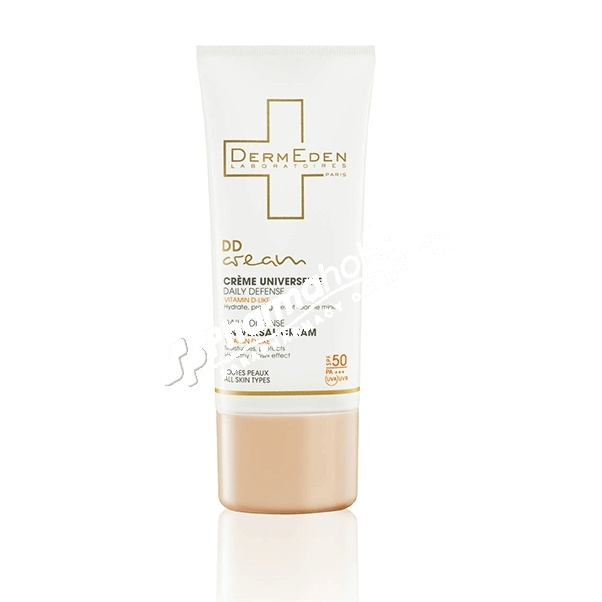 Dermeden DD Universal Cream Daily Defense SPF50 is dedicated to urban skin, under stress, to pollution and attacked by free radicals. DD Cream protects your skin from all aggressions and prevents the first signs of age. Particularly dedicated to urban skin, under stress, to pollution and attacked by free radicals. DD Cream protects your skin from all aggressions and prevents the first signs of age. Enriched with VITAMIN D-LIKE, it is the very first day cream to solve the equation UV protection / benefits of vitamin D, essential to the body and skin. Moisturizing, anti-aging and with UV protection, its universal formula specially designed to respect the nature of all skin, contains "chameleon" pigments that adjust to each skin tone. Apply every morning on your face, neck and décolleté by circular movements and massage until obtaining the perfect match with the hue of your skin. Excellent makeup base.